I can’t write about traveling in Taiwan without mentioning Taiwanese coffee. Not only must it be the best in Asia, it is likely the most expensive as well. The sheer number of coffee shops is astounding. I have no idea how these businesses survive in such concentration. To our surprise, good coffee is ubiquitous in Asia—Taiwan is serious about it. While you can never go wrong at Taiwan cafes, at up to $8 a cup, order with caution. 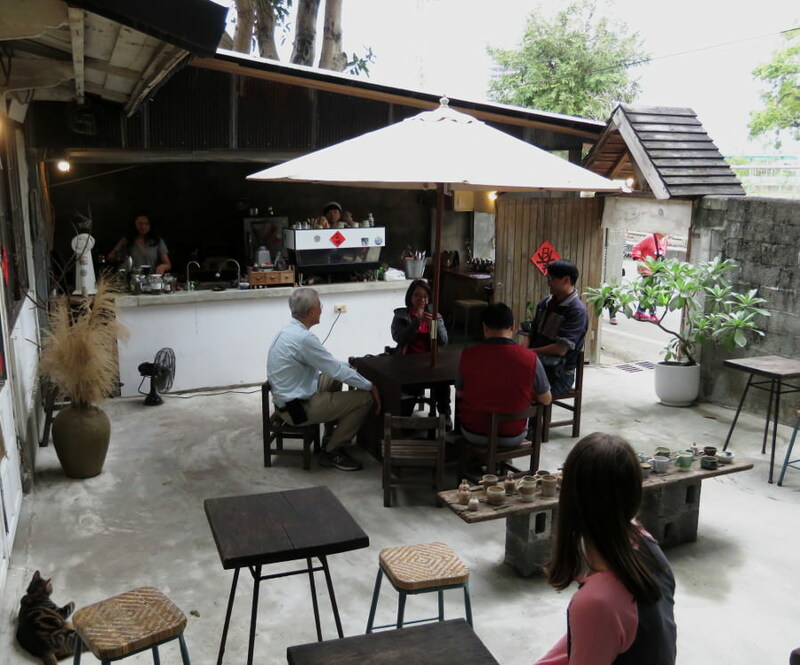 Hidden down a quiet street in Hualien, Giocare cafe is worth seeking out for the excellent coffee. This Taiwan cafe also offers a lovely courtyard setting and beautiful pottery. Skip when it’s raining though. 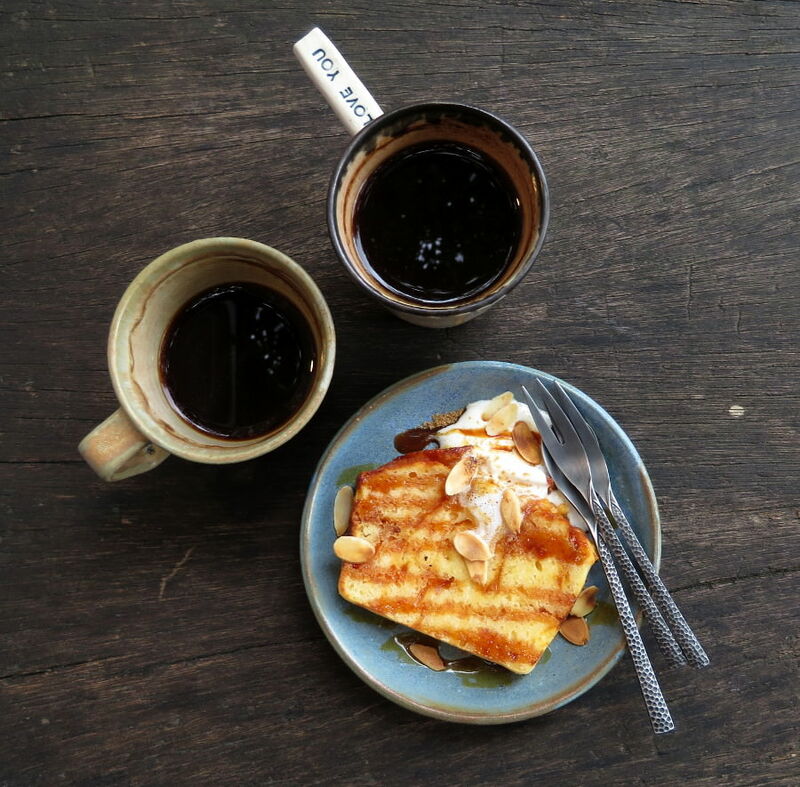 Caffe Fiore in Hualien might be Taiwan’s cutest coffee shop. There’s only a couple tables for seating. 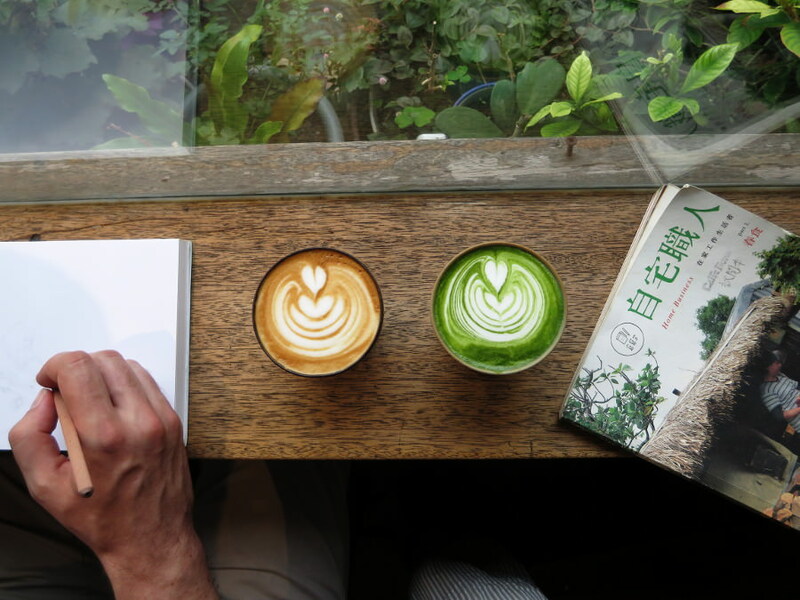 We enjoyed our coffee and matcha lattes at the tiny window counter. For a glimpse of the interior, see one of my favorite drawings from the trip. Ah, Taiwan. So began my love affair with méiguī (rose) lattes. 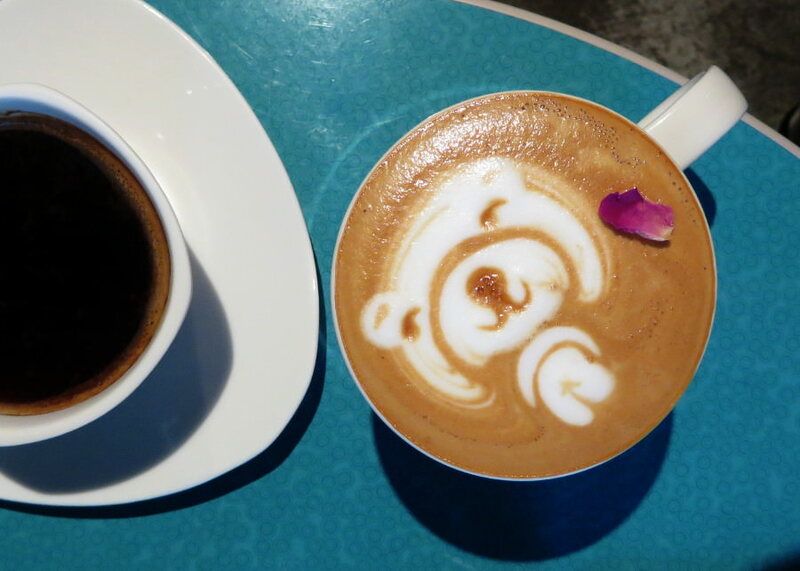 I was introduced in the form of cute latte art at Xiaomijo, a silent cafe in Taipei. The interior of James House, a coffee shop in Taipei. At $8 a cup, maybe this is special occasion coffee. I promise it’s worth it. There are lots of choices to make, but the friendly owner will walk you through them. This is the only cafe I’ve ever seen that uses house-made sweetened condensed milk in their lattes. You might even get to see a Matt Queen original on display. 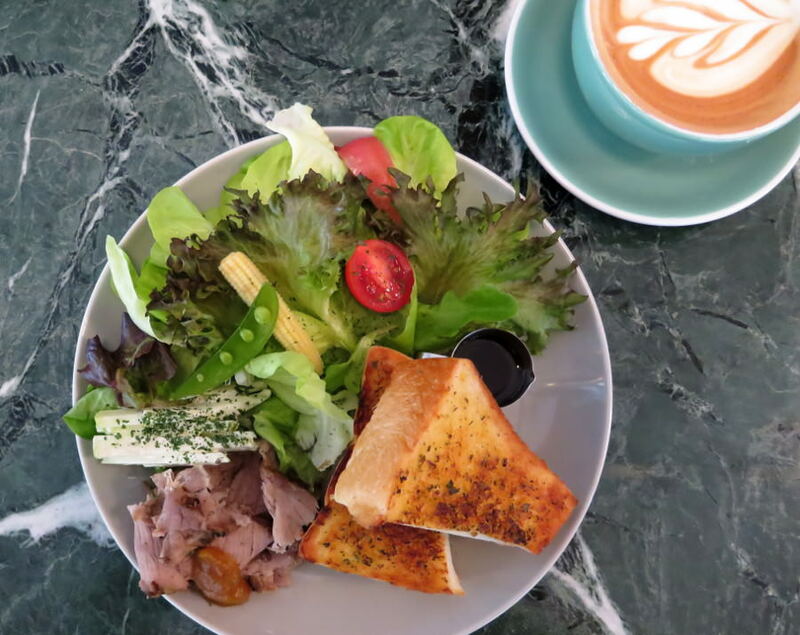 Fortunately, many Taiwan cafes also offer excellent food. Most often, it was house-made cakes and other treats. But sometimes, the extensive food selection even outshined the coffee. Doughnuts! Need I say more? 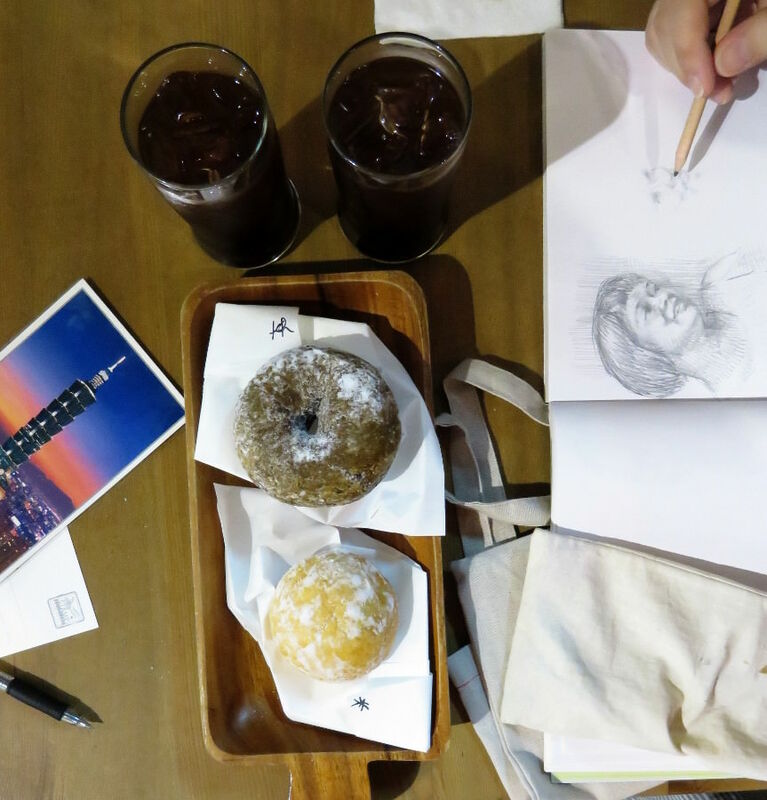 Drawing (for Matt) and writing postcards (for me) at Haritts Donuts & Coffee in Taichung. 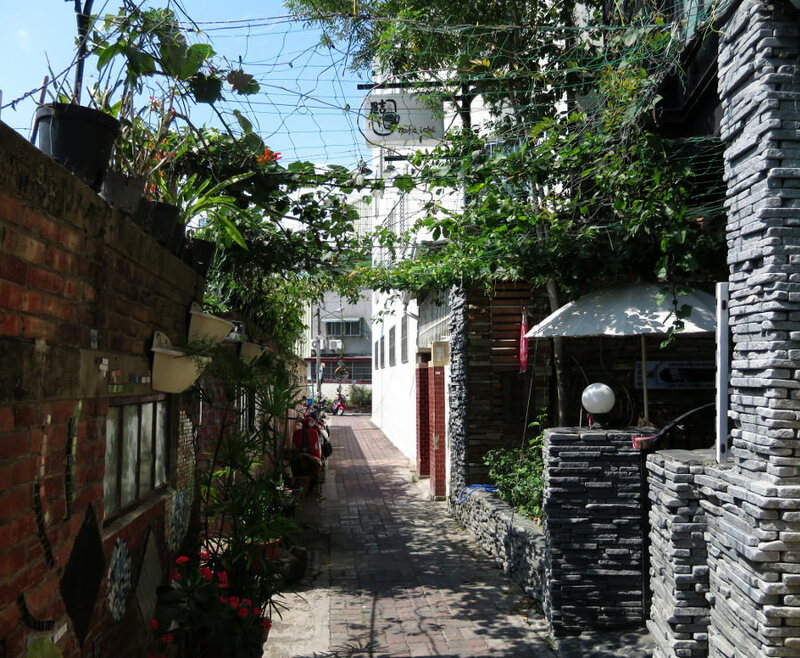 Taiwan cafes are often hidden down cute side streets, like Tainan’s Cafe Ichi. We went in for coffee but delighted in a Japanese brunch menu and delicious bread. I gobbled down my smoked fish toasts before realizing I forgot to take a photo. Matt enjoyed his soufflé pancakes. 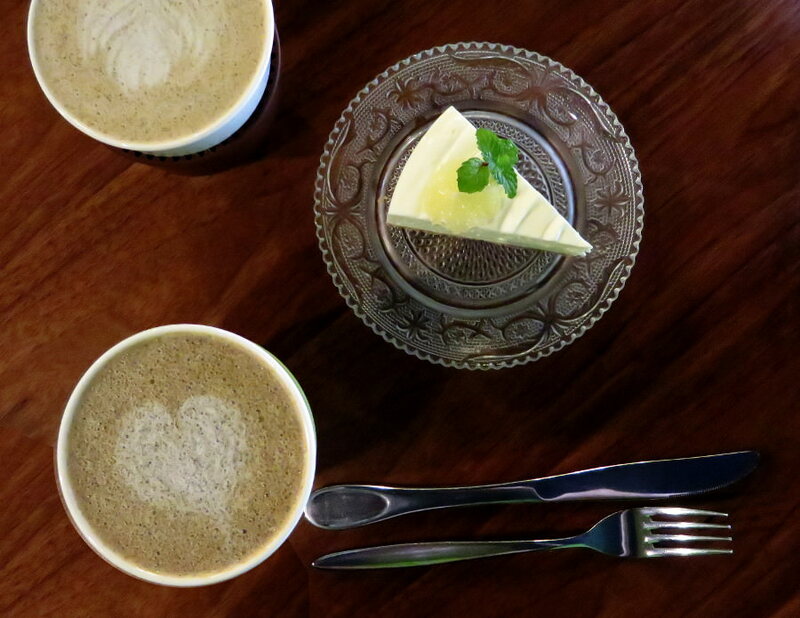 Giocare cafe in Hualien serves cake and coffee on handmade plates and cups. An antique store on the ground floor and a cafe on the second floor, Tainan’s Paripari makes a unique spot for a meal. While enjoying cappuccinos and egg salad sandwiches, we spied this beautiful composed salad. Of course, we couldn’t resist ordering it. 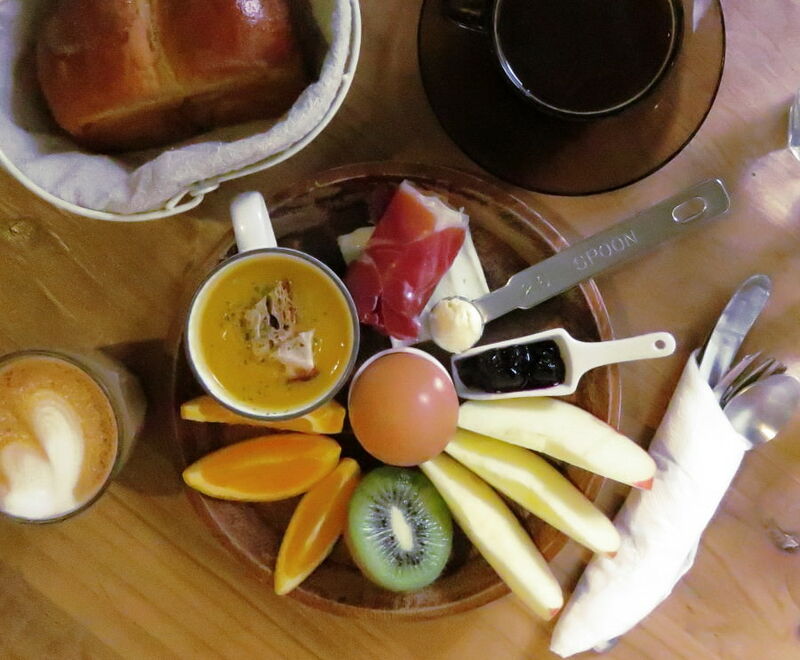 We went into Cheri Bibi cafe in Taipei for coffee but ended up with a full brunch spread. The coffee was good, but what I remember most was the delicious house-made bread. And the fun “menu” that displays all the dishes in felt. I ordered green tea ice cream by mistake. Good thing ice cream is never the wrong choice. It’s hard to believe there was a time when I didn’t now the word for ice cream in Chinese. (Essential vocabulary: 冰淇淋, pronounced bīngqílín). We’re coffee drinkers. Still, we do enjoy tea. Taiwan excels at both. Usually, we drank coffee (and boba tea). But there was a traditional tea shop right next to our Tainan hostel, My Second Floor Homestay. Both the tea shop and the hostel are now on my list of favorites. 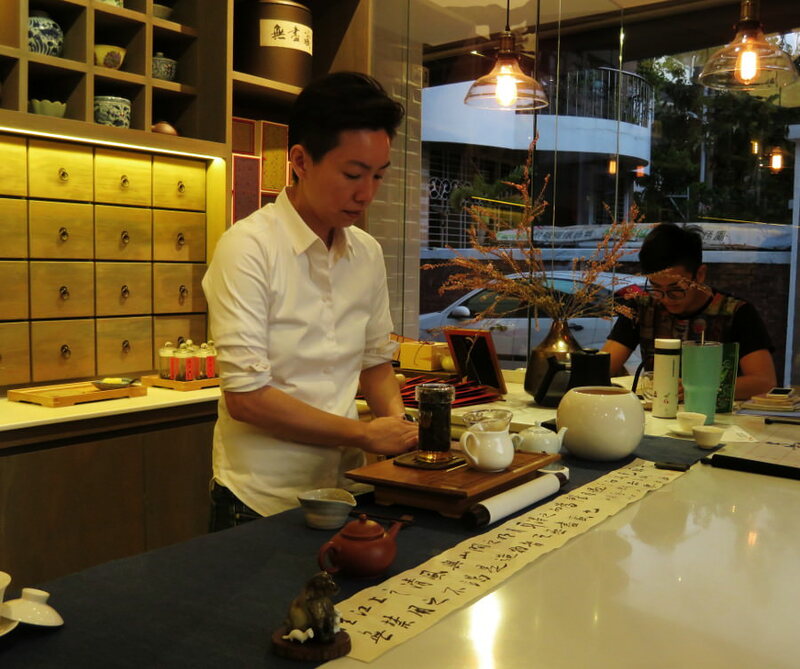 We spent a lovely evening enjoying the tea, company and calligraphy at 揣茶 in Tainan (English name: Try Our Tea First). Random fact: the character 茶 in the name of this charming tea house means “tea” in Mandarin and Taiwanese. But the pronunciations are not similar (茶 is chá in Mandarin). The Taiwanese word is tê (teh). So the English word actually comes from Taiwanese. We spent five weeks in Taiwan. That’s a lot of time to drink coffee. But not enough time (or so it seems) to photograph everything. So here’s a few more Taiwan cafes worth mentioning (sans photos). In Kaohsiung, we spent an evening at 大城小事珈琲 (English name: Big Town Small Things Coffee) after visiting Cijin Island and the Pier-2 Art Center. I always love learning about a subject I know nothing about. To that end, the National Museum of Taiwan Literature in Tainan is engaging and free. Afterwards, we enjoyed coffee in a tiny street nearby at 甘單咖啡館 (no English name). In both Tainan and Taipei, we found local coffee shops right next to each other. But near train stations, finding decent cafes can be more difficult. We were happy to have coffee and breakfast at Sweet Heart Cafe before catching our train in Tainan. 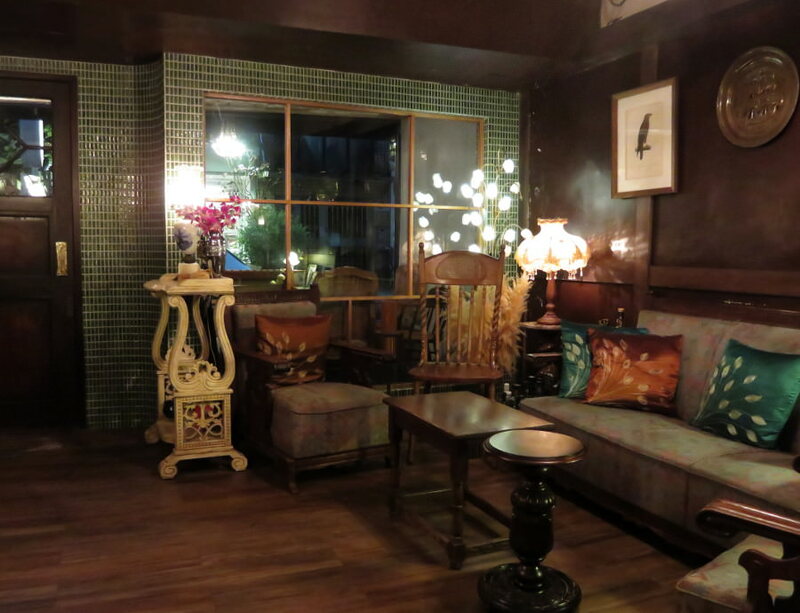 We spent our first night on the eastern side of Taipei at Jiyinn Coffee. Dessert shops were closed that night, but coffee at 11 PM on a Sunday? No problem. It’s hard to find due to it’s second-floor, residential location. And the fact that it looks like someone’s apartment. Be bold (and quiet), and walk right in. Finally, for cafes in the Da’an vicinity of Taipei, I plan to write yet another post about Taiwan. Besides the cost, I do have one complaint about Taiwan cafes: the hours. Finding coffee at local cafes before noon was almost impossible. Locating a cafe open late into the night was easy. To be honest, this problem was not exclusive to coffee shops. At first, I was also frustrated dessert shops closed by 7 PM. But by the time we reached Tainan, we had a workable schedule sorted out. Sleep until 10 AM, then start the day with fish soup, dumplings, or douhua. Proceed with sightseeing, followed by an afternoon snack of shaved ice or boba. Sometimes, we ate dinner at a local restaurant. Regardless, we finished the day with coffee. As you can imagine, bedtime was never before 2 AM. Yeah, it’s a hard life traveling Taiwan.